Authored by: Terence Diggory, Ph.D. The New York School started in the 1950s and was one of the most influential movements of American poetry—from the last half of the 20th century to today. 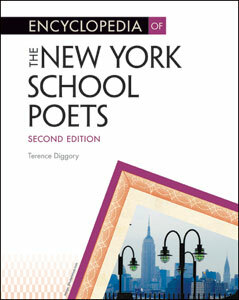 In more than 400 entries, Encyclopedia of the New York School Poets, Second Edition is an encyclopedic A-to-Z reference to writers of the New York School, including John Ashbery, who is often considered America’s greatest living poet. This updated work is a compelling examination of this significant movement in literary history and its development through the years. Terence Diggory, Ph.D., is professor of English at Skidmore College in Saratoga Springs, New York. His publications include The Scene of My Selves: New Work on New York School Poets, William Carlos Williams and the Ethics of Painting, and Yeats and American Poetry: The Tradition of the Self. His essays on the visual arts of the New York School have appeared in several journals and exhibition catalogs.